QUINCEY P. MORRIS: EXPLORER, ADVENTURER--VAMPIRE .. . Rough and ready Texan Quincey Morris thrust his Bowie knife into Dracula's heart, bringing an end to the quintessential battle between the living and the Un-Dead. 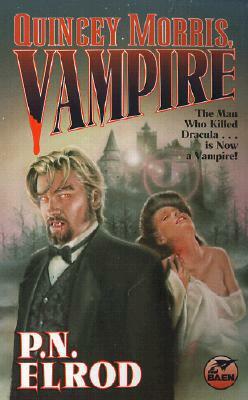 It also brought an end to Quincey as he bled his life away into the chill earth of Transylvania. Waking to the night, surrounded by ravenous wolves, he finds himself plunged into his greatest adventure yet: life beyond life--as a vampire. To survive, he must quickly adapt to his dark change. At the hands of his savage mentor it's a hard, painful process, but Quincey is determined to escape the wilderness and return to his grieving friends. However, Professor Van Helsing has convinced them that the only good vampire is a dead one. Seen as an acolyte of their greatest enemy, can Quincey persuade them to accept his change, or will a lifetime of friendship end in bloody betrayal? And for whom?